Within a week of Tesco opening its doors Stokes Croft has found itself the focal point of serious violence theessaycluband confrontation. Over the last few years our beloved community has undergone an amazing home grown resurgence. We are therefore devastated that Tesco’s refusal to listen to what the majority of local people want has resulted in our vibrant, peaceful community being subject to such a sad state of affairs. We are also deeply saddended to witness the reality that we live in society in which young people feel the only way to see justice done is to throw rocks. The reality is the government / corporations / media have created this society and are now trying to blame young people for the mess they have created. What future can we hope for if corporations are allowed to continue to dictate governments? If their insatiable appetite for profit is allowed to reign supreme? For over a year the majority of the local community have worked hard to peacefully campaign to stop Tesco from opening. 2500 people sent postcards to the Council, thousands more signed petitions and 96% of 700 people surveyed said they don’t want a Tesco. Despite such overwhelming opposition Tesco decided to totally ignore the wishes of the majority of the community. We painstakingly navigated the planning system and presented an overwhelmingly strong legal case for the argumentative paper on gun control Council to refuse Tesco planning permission to open. Yet Planning Officers ignored our objections and refused to engage with us. We insisted an impact assessment was needed around the threat over 40 deliveries to the store would pose to our community’s safety. Planning Officers told us this would be illegal and so refused. We pointed to the fact that Cambridge City Council had refused permission for the same application on the grounds of deliveries. Again we were ignoed. Various legal experts confirmed we were correct. Yet still Planning Officers refused to discuss this with us. Yet just minutes before permission was granted, the Council’s solicitor finally admitted they had got it wrong and the threat posed by deliveries to the store was in fact a ‘material consideration’. However, but this stage Councillors were thoroughly confused and so granted permission anyway. We are currently pursuing a Judicial Review of the Council’s decision because we are of the firm belief that Planning Officers failed to follow proper procedure regarding deliveries to the store and subsequently wrongly granted permission for Tesco to open. Watch this space for updates. We think it is essential that Tesco does not reopen on Cheltenham Road. We do understand that they feel it is important to not be seen to give into violence. However we feel strongly that their withdrawal would simply be a long overdue recognition that they are not wanted in our community. 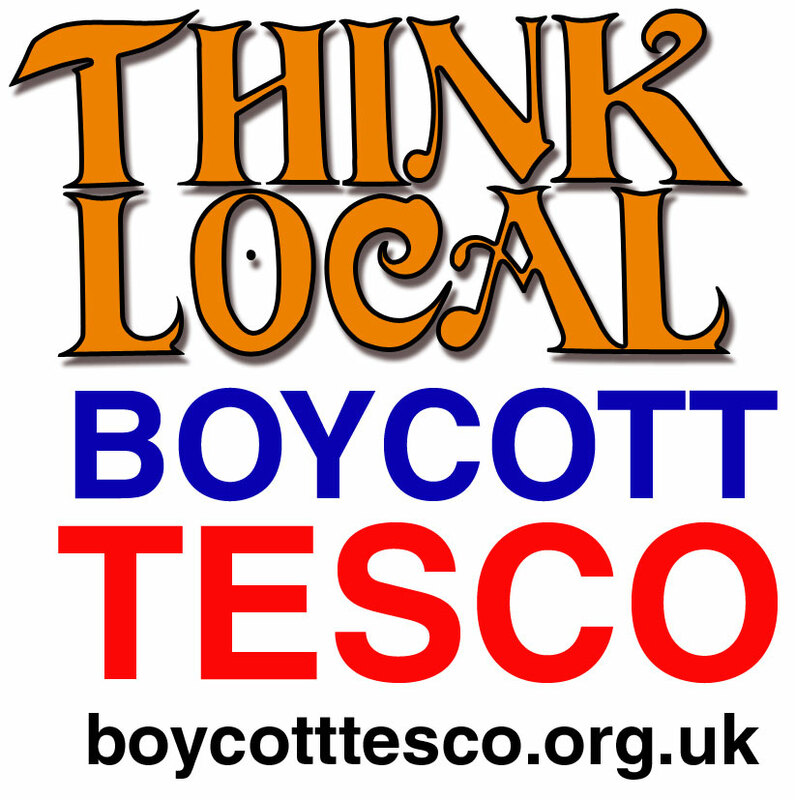 On their website and in their Corporate Social Reponsibility report Tesco claim to listen to the local community as soon as they identify a site. We are calling on Tesco to remain true to this. To recognise that they are not a positive contribution in our community and that the only fair thing to do is leave. We are soon to begin mediated negotiations with Tesco and other key stakeholders. We look forward to being able to discuss this with Tesco and can only hope that they come to the table as human beings with their hearts wide open, rather than as representatives of their corporation who have left their moral values at home with their spouse and children. Building work continues apace in the former Jesters Comedy Club. It is understood that Tesco Plc have withdrawn their application to overturn the refusal of an Alcohol Licence. Presumably intend to open without selling alcohol. The No Tesco Group is currently considering the possibility of taking the Council and Tesco to Judicial Review, a legal process that is demanding for all concerned. There is a few more weeks to go before the deadline. Meanwhile, we received notice last week that Tesco PLC are to appeal the decision to refuse them an alcohol licence. A time is yet to be announced for this appeal meeting. Meanwhile, Tesco have begun works on their frontage, behind secure barriers. However, this is only the beginning… Stokes Croft is an area of the City that aspires to question the status quo and to promote ideas and to create an alternative vision. It is increasingly clear that the kind of food and general retail distribution system offered by the likes of Tesco PLC is disastrous for local community, and threatens the sustanability of our fragile planet. Our role must therefore be to highlight and to explain why Tesco and their ilk are to be shunned. The NO TESCO team is also pursuing the possibility of a local food hub, and are actively seeking premises in the area. It is a source of regret on behalf of the No Tesco team that no meaningful dialogue ever took place between the local community and Tesco. Even more regrettable in this episode is that our City Council have been found to be lacking in courage and moral fibre. In fact, it is arguable that their behaviour in this regard seriously weakens their claim to be part of the democratic process, and by extension, their right to govern in our name. Councillors voted by 4-3 in favour of allowing Tesco to open. The remaining barriers, according to our planning system were the noise assesment to the rear, where Tesco intend to install huge freezers and chiller rooms. The detail of the shop fronts were also in dispute, and it was also considered by the Anti- Tesco group that there had been no impact assessment over servicing of the proposed retail unit, and that this should be a material consideration. At this late juncture, I think it is perhaps appropriate to review the journey that has brought us to this point, because this will help us to see more clearly. The applicant, Tesco PLC, applied for change of use in the name of an agent, with a Bath address, fulfilling the minimum legal requirement for consultation. ie. a small ad in the Evening Post, one A4 poster in the street, and 50 letters to locals, to which there were no replies to the Planning Dept. As soon as Tesco’s possible arrival became common knowledge, there was furore. 2500 complaints were sent to the planning dept. 93% of locals who were surveyed said that they did not want a supermarket in the former Jesters Comedy Club. On top of this, the building was squatted by locals who started to use the buildings as a community space. These squatters were evicted by bailiffs in March at a reported cost of £60,000. It is still not clear who footed that bill. Since then, five security guards have guarded the property 24hours a day, seven days a week. Barricaded front and rear, the property resembles a military encampment. Can this supermarket that claims that “Community is at the Heart of everything we do” really be in such fear of the community they intend to serve? It is our contention that the Community was hoodwinked: Because the local community forfeited the right to make its opinions felt from the beginning, we have been forced to fight this campaign on narrow grounds. Today we are notionally here to discuss shop fronts, congestion and probable noise levels. The proposed retail shop front, which will permanently combine what was originally three shop fronts, makes a mockery of the notion of conservation of traditional streetscape. Furthermore,The No Tesco campaign has clearly shown that the likely amount of servicing by large delivery lorries required by the proposed supermarket will cause serious and prolonged traffic congestion on a main arterial road, and on a bus lane. The proposed refrigeration units to the rear will be noisy, and though the noise report submitted is slick, it is clearly misleading. Even on the narrow planning grounds where the No Tesco campaign has been forced to fight, it is abundantly clear what the applicant is attempting to do: By seeking to cram as much as possible into a space that is clearly not designed for such an operation, Tesco have shown that their goal is retail conquest by any means possible. This will certainly be damaging to the fragile but enduring local economy, and this is not acceptable. Net local employment would be certain to fall. I would remind you that Stokes Croft and Montpelier are both designated Conservation areas, both defined by their independent local businessesand by their alternative culture, characteristics which are treasured to the extent that Stokes Croft now defines itself as “Bristol’s Cultural Quarter”. The proposed incursion of a ubiquitous supermarket chain represents the very antithesis of our Community’s aspirations. It falls to you today, councillors, to decide where you stand. The incredibly hard working and diligent No Tesco campaigners have given you sufficient reasons to back the aspirations of our communityand to refuse Tesco’s application. It is up to you now to make your choice. There is a clear change in the way the political wind is blowing. Our own Central Government has finally recognised the failure of our planning system to deliver decisions that make sense, and will soon cede decision making to local community groups. I urge you to heed the winds of change, indeed to be in the vanguard of this change. Take courage, back the local community and refuse to allow any supermarket chain into our community, by all means possible. Unfortunately, our councillors were not listening…were not listening to the people who elect them to act in their interests. The meeting ended in uproar. Cries of “Shame” rang around the room, and severl people were physically ejected by security, including Mr. Chalkley. Stokes Croft has been blighted by poor planning decisions for decades. This is another of these, and clearly calls into question the legitimacy of the planners and our Councillors to act on our behalf. Our Central Government is on the verge of publishing a new Localism Bill, which is at the heart of the Coalition’s new shiny plans for Mr. Cameron’s Big Society. Perhaps this decision will be the catalyst that kickstarts the process whereby our local areas demand real autonomy. 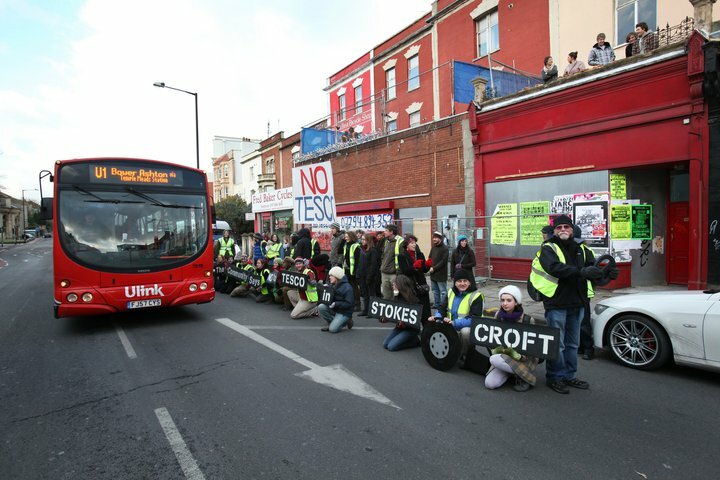 At 2pm today over 40 campaigners formed a human Tesco delivery lorry on Stokes Croft in order to highlight the dangerous number of deliveries that will block a busy road, cycle path and bus stop if the proposed Tesco store gets planning permission next week . The Council’s planning team are refusing to assess the impact of such deliveries because they say it is not relevant to these applications. But the Government’s Planning Inspectorate, the final authority on this says otherwise. The demonstration today is vital to make sure the Councillors, who will ultimately make the planning decision on the case, have the correct facts and are not swayed by the inaccuracies and misinformation of Bristol City Council’s planning team. Councillors will meet again at 2pm on Wednesday 8 December at the Council House to decide whether Tesco can open on Cheltenham Road. Tesco would require six lorries to deliver within a six hour period every day, blocking this main route into the city, a cycle path and a bus stop, for up to 40 minutes a time. This totals a staggering 42 weekly deliveries potentially obstructing the road for 28 hours – at times the store manager often cannot predict. And if that isn’t dangerous enough, the extremely narrow Picton Lane will be used for thecollection of refuse and recycling. that is incredibly similar to the one proposed. The proposed location is simply not an appropriate site for a store like Tesco which requires a high volume of deliveries and collections made in large vehicles and involving metal cages that would cross the pavement and cycle lane for prolonged periods of time. The vehicles would unload across a cycle path, immediately next to a bus stop and two busy crossroads with pedestrian crossings and in an area where cyclists, school children and people with limited mobility are likely to be particularly concentrated. The threats to public and highway safety are significant and it is inconceivable that no assessment has been made. Planning Report Released – Take Action NOW! Today, WEDNESDAY 1 DECEMBER, we are demonstrating our point about the disruption that deliveries will create. We will meet at the Canteen at 2pm to move together to the proposed site where we will form a human delivery lorry to highlight how ridiculous it would be to have 6 deliveries a day for 40 minutes a time, equating to one an hour every hour between 10am and 4pm. We are also holding a public meeting on Monday 6 December (this coming Monday) at Hamilton House, please come along and show your support. There is just one week left until the final decision is made – this is your last chance to take action for your community. The Planning Officers have now released their report to Councillors ahead of the hearing on Wed 8 December. Thank you to the more than 100 people who sent in objections. – The Council have dismissed our comments about deliveries, SPD10 and the Community Involvement Statement, saying that these were addressed and dismissed at the 22 Sept meeting. We do not agree. – Without any justification or explanation, the Council have dismissed the points raised about the acoustic report that highlights significant inaccuracies pointing to the machinery not being able to meet the Council’s conditions.This means they have basically consulted the community and then totally ignored our responses without any explanation. This is totally unacceptable. Are they are happy that our comments have been ignored with no explanation? It was they who insisted that an acoustic report was needed for a decision to be made – are they now happy that this decision will be made without any attention being paid to significant inaccuracies being detected? Please come along to the public meeting on Monday 6th December and act now for your community. Tesco’s noise report was full of holes. Thank you to the many of you who sent in letters pointing this out. The Council has now raised this with Tesco and they are due to clarify the situation this week. Watch this space – they will have to consult us all again if they want to amend the report. 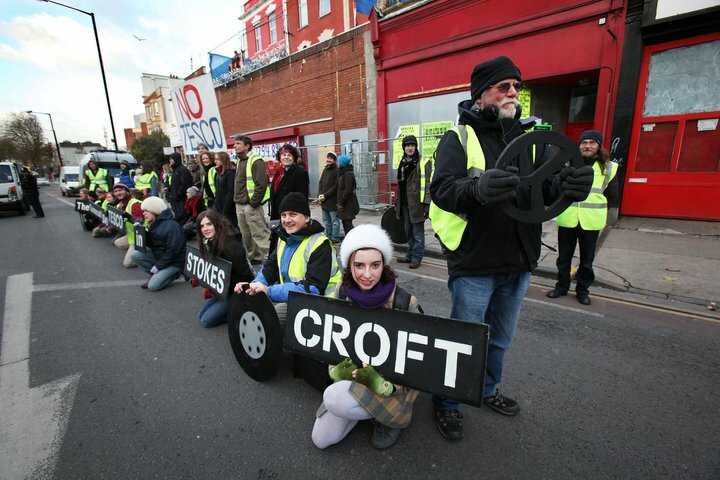 We’ve kept Tesco out of Stokes Croft for a year! 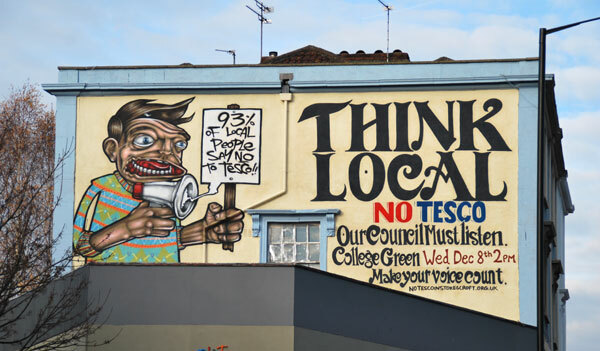 The community’s response to Tesco trying to open up shop in Stokes Croft has been immense: 2500 postcards were sent to the Council objecting to another supermarket and demanding consultation; and 96% of local residents surveyed said another supermarket is not necessary – with already 5 Tesco’s within a mile. Even the leader of Bristol City Council and our local MP have both publicly supported our campaign and have written to Tesco asking them to respect our culturally distinct community and go away! Still they continue to try to drive their way into our high street. Unfortunately for Tesco, they got more than they bargained for in Stokes Croft. They bought the lease on the site in Cheltenham Road last November and a year on, more determined than ever, we continue to resist their invasion into our community. The energy that has come out of this lengthy process has been overwhelming – community spirit feels incredibly upbeat and focussed. This is what happens when bullies try to dis-empower the masses: we only grow stronger! Thanks to all your letters of objection Tesco have been refused a license to sell alcohol in Stokes Croft. This is no mean feat and sends a strong message to the UK’s largest food retailer about the power of local communities – a massive well done to everyone! Find out more about the license refusal HERE. On 22 September Bristol City Council held a public meeting to decide whether Tesco could open in Stokes Croft. Hundreds from the community attended to voice a definitive NO and to witness justice be served. After a lengthy and astonishingly pro-Tesco performance by the Council’s Planning team, Councillors decided that the decision should be deferred due to the lack of an acoustic report and Tesco’s failure to comply with certain conditions. Tesco has now submitted its acoustic report and amended plans and Councillors will meet again on Wednesday 8 December at 2pm to assess this new information, listen to our objections and decide whether to grant permission for the proposed Tesco Express store to open. The Council originally announced the meeting date as 27 October but following insistent complaints from the No Tesco in Stokes Croft campaign that this would not allow sufficient time for the community to respond, the meeting has been delayed until December. This is an important victory for the campaign highlighting that this is a battle worth fighting because with enough determination the Council are starting to respond to their responsibility to listen to the community. Read a full update about the 22 September meeting HERE. It is important to remember that the Council is between a rock and a hard place. Supporting the wishes of the community and rejecting Tesco would make them vulnerable to heavy financial implications because Tesco would attempt to sue them. However it is about time the Council stuck it’s head about the parapet and paid more than lip service to its claims to be the Green Capital. For sure they would be celebrated by communities the world-over for standing up to this oversized and insatiable Goliath. Make sure 8 December is in your diary, spread the word and check out the TAKE ACTION page to find out how you can object to the planning applications, get involved and support the campaign. Together we CAN stop Tesco from opening in Stokes Croft! February 2010 – An inquisitive local found out the workman in 140-142 Cheltenham road were down from London to fit out a new Tesco shop. Word travelled fast that Tesco was trying to open a shop in Stokes Croft by stealth. Over 200 locals turned up to a meeting at Hamilton House. Turns out Tesco applied for planning permission under a different company name back in November 2009 – so much for the community engagement stuff on their website. The Council, who didn’t realise Tesco were behind the application, sent letters to 55 addresses in the area asking if it was OK to change the use of the building from an entertainment venue to a shop. No more detail than that. A group of people quietly left the meeting and took matters into their own hands. They took back the premises over night and turned it into a wonderful temporary community space. There were meals, music, language classes, and film showings. The rest of us turned up to protest on Saturday 13 Feb 2010. The whole of Cheltenham Road was full of people who came to wave placards, blow horns, bang drums, generally make their voices heard. Following the protest the campaign really got going. Over 2500 people sent postcards to the Council saying the consultation was not good enough. We needed to find out what local residents really think about a supermarket opening up. Teams of people asked over 500 locals what they thought the impact of a supermarket would be on traffic, the local economy and whether they agreed with the ethics of big supermarkets. 96% of people asked felt a Supermarket on Cheltenham Road would be bad for the area. March 2010 – A few people went to Bristol City Council to meet with Barbara Janke, Jon Rogers, Zoe Willcox, Nigel Butler and Gary Collins. They were helpful in explaining the predicament we find ourselves in but they say they are powerless to act despite clear opposition to Tesco by the majority of people in the local area. The Planning Process favours big business and leaves people with little power to influence development in their local area. This campaign is not just about stopping Tesco against the odds but a way to show that planning and development has to change to put people at the heart of the process. While we were reading boring policy documents and talking politely to the Council, the people peacefully occupying the site had war waged against them. Talk about heavy-handed! Tesco have hired a security firm to turn the Old Jesters into Fort Knox. When it comes to integrating with the community they seem to be going from bad to worse. – Without any justification or explanation, they dismissed the points raised about the acoustic report, highlighting significant inaccuracies that point to the machinery not being able to meet the Council’s conditions. This means they have basically consulted the community and they totally ignored our responses without any explanation. This is totally unacceptable. So we really need to point this out to the Councillors ahead of the meeting – asking them if they are happy that our comments have been ignored with no explanation. It was they who insisted that an acoustic report was needed for a decision to be made – are they now happy that this decision will be made without any attention being paid to significant inaccuracies being detected? “[as] Executive Member for Transport and Sustainability …the work of the Planning Department is part of myportfolio. He says he saw the application “but did not think of it as a concern…The decison to allow a change of use seems legitimate. I see no legal grounds to challenge it”. So yet again local views are ignored on planning decisions. First it was the Dovercourt development, then the decision by officers and Lib Dem councillors to spend most of the S106 Dovercourt money on roadworks on Stokes Croft and not Montpelier Park, and now this. Not good enough! The Council – officers and councillors – need to listen and respond to local views. I have had the following email from a resident, “As an ardent supporter of yours I’m hoping this ‘washing hands of it’ is a misrepresentation of your position?“. YES, it is a gross misrepresentation of my position! The anonymous and mischievious “Trevor” is very selective in his quote. He fails to make clear that no-one, not local residents, not local community groups nor indeed council planning officers could have been aware that the request by Jesters Comedy Club to change use from “stand up comedy/performance venue (Use Class D2) to shop (Use Class A1) on the 26th November 2009 (BCC ref 09/03838/F)” would apparently lead to Tesco taking over the lease. I understand that a hoarding licence was issued by the council on 4th February 2010. There is an existing Traffic Regulation Order (TRO) in place on Cheltenham Road which prevents loading and deliveries between 7 am and 10am and 4pm and 6.30pm Mondays to Fridays. Planning conditions also control the hours of servicing and refuse collection. The details are in the delegated officer report on the planning web site. I understand that Tesco is yet to apply to BCC for a premises licence to sell alcohol. Thanks to the various officers for their speedy replies. Let me know if you have further questions or if I can help in other ways. You can use http://www.writetothem.com/ to contact your MP (Stephen Williams in this case) and let them know how you feel about the development and to urge them to oppose it. Jon Rogers resorts to personal abuse but does not deny the accuracy when I quote from his reply, or raise the Dovercourt approval or how its S106 money was spent. Please clarify, ‘Jon Rogers resorts to personal abuse’? Really? I think his response was very fair and very useful to the debate. He merely said that your paraphrasing of his email to you was ‘mischievous’. This is not ‘personal abuse’. I am grateful to see Mr Rogers taking part in the debate when he could so easily keep his head below the parapet. You quote only part of my reply, and your name “Trevor Cheeseman” does not appear on the electoral register for Ashley ward, so I stand by my “anonymous and mischievous ” (though spelt correctly this time). I directed readers to a fuller answer on the PRSC site at http://bit.ly/aUqlMU which is the full reply that you selectively quoted. If you have lived in Montpelier for 15 years as Trevor Cheeseman, then I will be happy to publicly apologise. I find Jon Rogers comments patronising. There is a lot of anger about this, as Saturday’s demo shows. Given the size of the former Jester’s, surely it should be obvious to Council planners that a big name chain was a possible occupant. I am trying to respond to comments openly and honestly. There is no intention to be patronising, and I understand the anger. However, I also seek to explain that under planning law, the identity of the retailer is not a material consideration. There are legitimate questions about whether people were informed and had an opportunity to respond to the application, but people who are used to seeing applications, including myself, did not think twice about an application by Jesters Comedy Club to change the use of it’s old comedy club into a shop. There are a number of people with a passionate interest in Stokes Croft, but they did not raise any questions when the planning application was published in October 2009. The application was published on the internet, along with 100s of others, and many of us get very regular emails about such applications in our area. If for no other reason than the only one they understand – money – the council should oppose this. Monopolies are incredibly damaging not only to consumer choice but also the wider economy. Studies clearly show that a diverse economy is a healthy one and with a Tescos at the bus garage and one on Gloucester road there is clearly need to regulate how many can operate within a certain area. Councilors with the balls to stand up to them ? As pointed out above, all local objections to the scale of Dovercourt were completely over ridden, so I very much doubt it. there is sense somewhere on this sceptred isle ! AMAZING Kevin! Thanks for this ray of hope! A similar ruling in Stokes Croft would be most welcome! Apparently the dispute went on for over 10 years… Well we’re prepared to be in it for the long-haul too! Very few members of the public look at planning applications, it is a failure of local representatives not to communicate this to the public. Unfortunately even when people are consulted, they are frequently ignored. Nick, take it you prefer a load of drafted-in green activists/squaters from London to spruce up the neighbourhood over a useful supermarket? Minority view mate. I’m currently doing an undergraduate dissertation on how to encourage consumers to buy more ethical and sustainable food and my results (from a sample of South Oxfordshire consumers) evidence that consumers do want to support local, independent retailers, they do want fresh healthy, non-imported food (for items that can be grown locally or nationally), they enjoy the social interaction and customer service of a local store and they are concerned about local farmers and the UK’s reliance on imported food, whilst local orchards and local farms are struggling to stay in business. British towns have lost their local butchers, fishmongers, greengrocers and my study sample want to see that change for both the health of their famillies and the environment. I’m in full support of your campaign, keep up the good work. Jessica, your middle class student dissertation is deeply flawed. The reason Tesco, and many other supermarket chains, have been so successful is that they can provide the food CHEAPER than a local organic shop selling apples sourced at a local orchard or meat sourced from a local farm. It’s all very well if you have the money, but if you have a family of five to feed on Tyneside (for example) in a recession where do you think you’d be most likely to go for your groceries? I also don’t think that all butchers, fishmongers and greengrocers instantly go up against the wall the minute a small supermarket arrives in the neighbourhood, if anything it encourages them to raise their game for the local people who are willing to spend money on, for example, locally sourced meat. This is called Market Dynamics. I think you obviously don’t live around here because the ‘campaign’ in the form of the squat has been cleared. If you lived around here you’d have found they were a noise nuisance and danger to passing people and traffic, I didn’t see them as ‘keeping up the good work’ to be honest. They were just renta-mob shipped in from London apparently by Greens and anti-capitalists. Also, for the record, the current choice of food stores here are rank. One in particular sells what looks like gone-off produce and allows their cat to walk around in the store. New housing in the vicinity warrants a food store to cope, and it stops people getting in cars to drive out to superstores. Infrastructure, basically. I was a student once Jessica, it’s great to be a idealist buy when you graduate you’ll be bought to earth with a jolt. As I’ve said before, if you were living here and pregnant in a few years time, you’d LOVE the Tesco. Honest. Its my 1st time on this site and having read through the comments a number of points occur to me which I would like to share. Firstly, and particularly in response to Dave, the proposed store is a Tesco Express ‘convenience’ style outlet and not a conventional pile-it-high-&-sell-it-cheap supermarket. Tesco Express stores are not cheaper than independent shops and are frequently excluded from national special offer camaigns. Indeed I have recently found that Tesco in Marlborough St is selling milk at up to 9p a pint MORE than Abduls by Turbo Island. Abdul also sources his milk from Chew Valley Dairies about 6 miles from Bristol. Regarding the various postings about Council consultation processes I can only contrast the de minimis approach adopted by the Council over this issue with the high level of community involvement and consultation for the development of the corner of City Rd/Stokes Croft. A personal concern of mine which I have not seen addressed anywhere is where exactly Tesco intend to park their servicing/delivery vehicles; knowing the area well I can’t see Picton St, Picton Lane or Bath Buildings being suitable for large goods vehicles which leaves Cheltenham Rd at which point traffic congestion is already problematic. I can imagine lorries blocking the exit from the bus/cycle lane. I also wonder whether the area needs another outlet for alcoholic off-sales given the abundance of licensed establishments around here as well as the (sometimes theoretical) existence of a ‘No Street Drinking Zone’ less than 100m from the proposed store. Apologies for the length of this posting. Andy, I can guarantee you that given a choice of Abduls by Turbo Island and a new Tesco, I think I know where the vast majority of people will shop for food. Also, the 9p will mean nothing to them on a pint of milk. In terms of deliveries the new Tesco will be no different to lots of other supermarkets all over the country. I should imagine deliveries will be made at off-peak traffic times. If you’re that worried about congestion, take relief that all the people in the huge new flats on the corner of Bath buildings won’t be climbing in to their cars when they need some provisions. You’d be up in arms about that if it wasn’t for the proposed Tesco, which I think you’ll find the silent majority of residents (as opposed to shipped in green activists from London) actually WANT here. Thank you Dave for your contribution. I get the impression that you perceive me as part of a ‘rent-a-mob’ that has a knee-jerk reaction to the word Tesco. Please be reassured that this is not the case; I am not a student, have never lived in London but do find that bringing up a young family causes me to take a serious view about the price of milk. and all the people say is “You’re late drive”, “Where’ve you been drive”. Bus lanes are for buses not for delivery lorries. Abduls milk is fresher than that obtainable from Tesco in Marlborough St and I know where it comes from. Take it you’re familiar with Loading Bays? I am very familiar with loading bays; I am also very familiar with Cheltenham Rd, Picton St & Picton Lane, indeed yesterday morning I watched with some bemusement a scaffolding lorry trying and failing to negotiate a manouevre from Picton St into Picton Lane. Loading bays are not really an issue when the physical constraints of the local road infrastructure are manifestly unsuited to use by large goods vehicles. Further consideration causes me to wonder how a loading bay for vehicles 2.66m wide can be installed in a pavement that is 1.2m wide. Perhaps the large hadron collider will enable us all to suspend the laws of classical dimensional physics. Are you really a bus driver, Andy? mmmm……..